Kerala's Minister of Law, L.K. Mani and India's VP Shekhawat hand over keys to beneficiaries. On the last day of Amritavarsham50, a joint venture between the Government of Kerala and the Mata Amritanandamayi Math was inaugurated by Kerala’s Honourable Minister for Law, Shri. K.M. Mani. The venture found the government donating more than 140 masses of land to the Math (10 in each district), which will, in turn, use the land to help meet its target of building 100,000 free houses for the destitute homeless by 2010. The first site is in the village of Ambalamugal, 40 kilometres southeast of Cochin. His Excellency the President of India, Shri. Bhairon Singh Shekhawat, then presented keys to new houses to 10 representatives from the village of Allappad. For these ladies—who had been living in rented, thatched huts located far from drinkable water—the free houses were nothing less than a Godsend. Professor Antony Isaac, Chairman of the Greater Cochin Development Authority, then announced another joint housing project, one wherein the Math would build 108 free houses on property donated by his department throughout Cochin. He then gave symbolic keys to 15 homeless families. Most of the recipients were women. When Professor Isaac attempted to hand the symbolic key to a man without any hands, Amma immediately came to the rescue, taking the key and lovingly put it in the disabled man’s breast pocket. 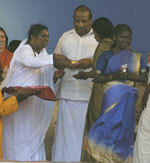 It was in 1996 when Amma first announce that She wanted to build and give away 25,000 houses across India. It was an incredibly vast gesture for the Math—not only because of the numbers involved but also because, at that time, the Math had yet to undertake a welfare project on such a grand scale. The Math has been engaged in building free houses for the poor ever since, and today you can find Amrita Kuteerams in Tamil Nadu, Kerala, Karnataka, Andra Pradesh, Maharashtra, Gujarat, Bengal and Delhi. In many places the Math has built entire colonies of homes, complete with community centres, temples, churches and mosques. The homes are given out on a need basis regardless of caste or creed. When the Math builds Kuteeram colonies, it isn’t just building homes but communities, place where people can get a new start in life, in surroundings conducive to peace and harmony.